It was a bit of a soggy Fourth of July here in Connecticut (how unpatriotic of the weather!) so after Jamie and I spent some time visiting my Mom, we came home and I decided that it might be nice to watch a Fourth of July sort of movie. 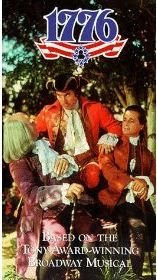 My original choice was going to be 1776 as I was inspired by Jamie of Duward Discussion and the fact that she and her family watch this great film every year on the Fourth of July much like a lot of other people watch It's a Wonderful Life at Christmas. Unfortunately, the only version of the movie I have is on a VHS tape (I really need to get it on DVD) and when I popped it into the VCR in my room not only did the tape not work but it got stuck! Oh dear ... what to do now? I was really in the mood for a Fourth of July musical! 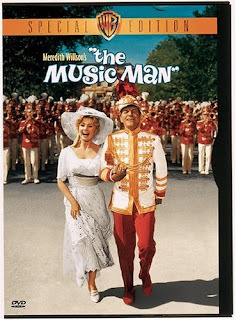 Fortunately, as I was just about to turn off the TV I happened upon another favorite movie that also puts me in a Fourth of July mood - The Music Man. Not the newfangled version with Matthew Broderick but the original version with Robert Preston and Shirley Jones - a true classic and a wonderful film full of wonderful songs. I've had the pleasure of seeing this play done on Broadway also when Craig Bierko starred in the role of Professor Harold Hill and it was fantastic. The funny thing about stumbling across this movie (which was being shown uncut and without commercial interruption - yay!) 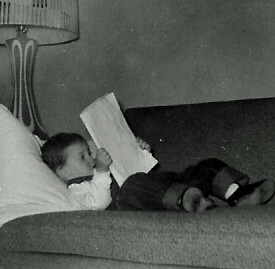 was that while reading a Fourth of July post by Empress Bee of the High Sea earlier in the evening it had got me to thinking about old-fashioned Fourth of July celebrations and how no one seems to have them anymore. To me, this movie is the epitome of old-fashioned celebrations and it always reminds me of the Fourth of July. Besides, Robert Preston is absolutely marvelous in it! Whatever you did to celebrate the Fourth of July, I hope that you had a good time doing it and if your celebrations take you into today enjoy and be safe. I'm keeping my fingers crossed that the rain clears up for the fireworks display in Norwich tonight! Do we all have to sing '76 Trombones'? I've never seen 1776 (I guess I need to go out and buy the DVD) but "The Music Man" is one of my favorites and I can watch it over and over. Maybe it has to do with the fact that Shirley Jones' character is "Marian the Librarian." You know, I've never seen '1776' - neither the play nor the movie! 1776 .. we love America! ..